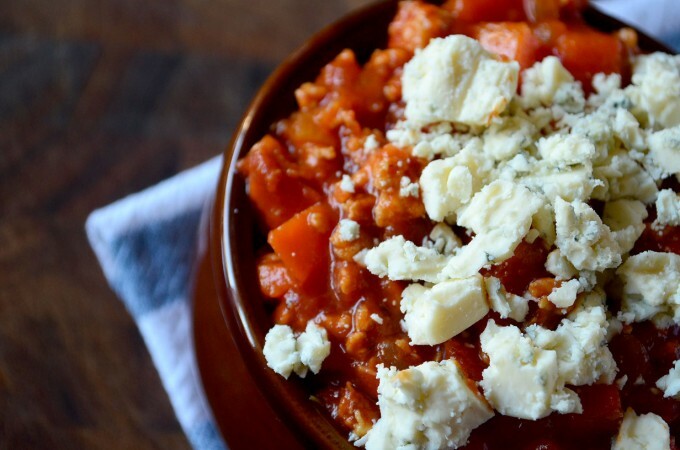 This Buffalo Chicken Chili is the perfect way to warm up a cold night. 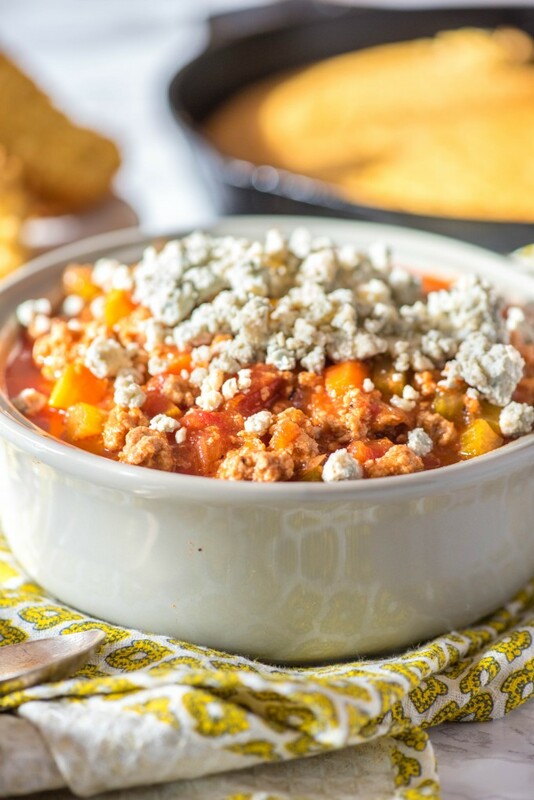 Whether you make it in a slow cooker or on the stove, it’s a super easy meal that combines the ultimate game day snack-buffalo wings- with the ultimate comfort food- chili! The Rangers play the Yankees tonight, I think. All kidding aside, I know there are three certainties in life- death, taxes and that fall and winter evenings in our house invove football. Let’s be honest, nothing goes hand-in-hand more than wings and football (well, maybe beer). For as much as Dave loves football (although admittedly he has backed off his love of football since Peyton Manning retired and he no longer has a team to passionately root for! ), he might love buffalo wings even more-and THAT is saying something. I found this recipe in a Rachel Ray cookbook about ten or so years ago, made it for Dave, and it quickly became a hit with him. I’ve passed it along to his family and our friends, who have been urging me to post it for awhile. So here you go– an easy (and likely healthier!) alternative to chicken wings. 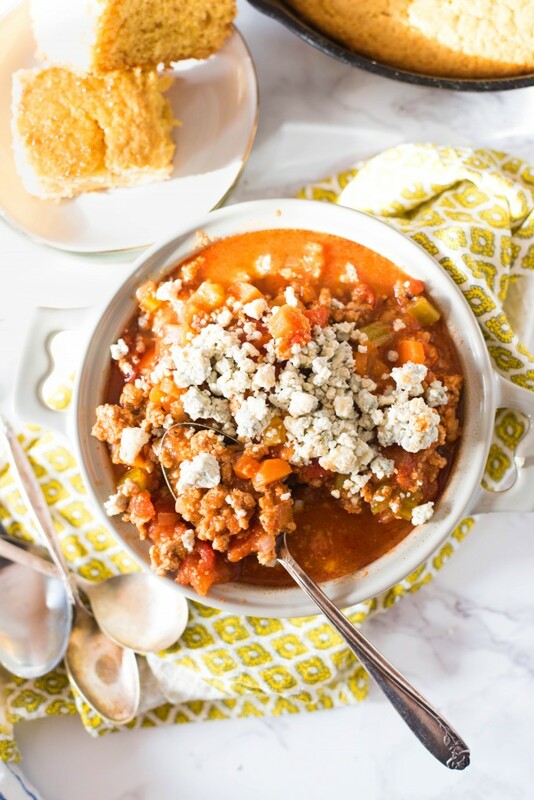 This recipe is easily adapted to a slow cooker, crockpot, or Instant Pot as well. For a crockpot, just add everything to the pot, stir together and cook on LOW for 6-8 hours or HIGH for 3-4. 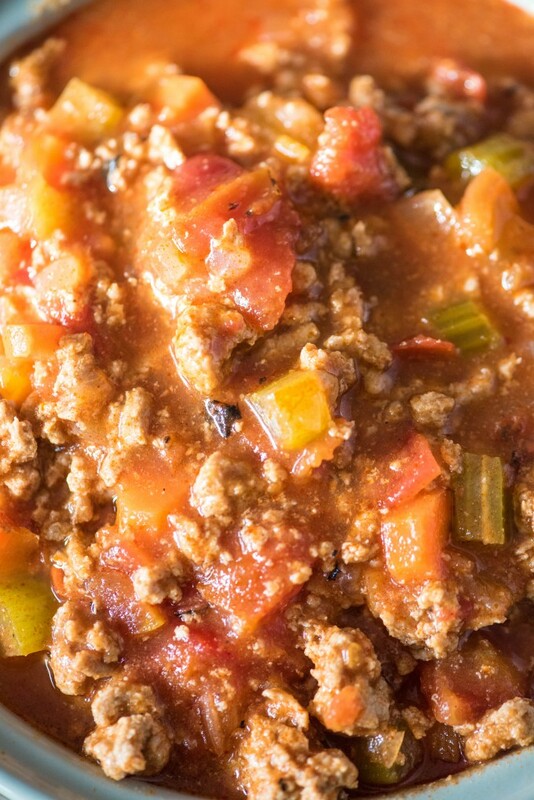 For Instant Pot, use the chili setting for 20 minutes, let natural release for 10 minutes, then quick release. Up to you whether you’d like to sauté the chicken and vegetables first. If you do, you’ll probably only need about 10 minutes on the chili setting. 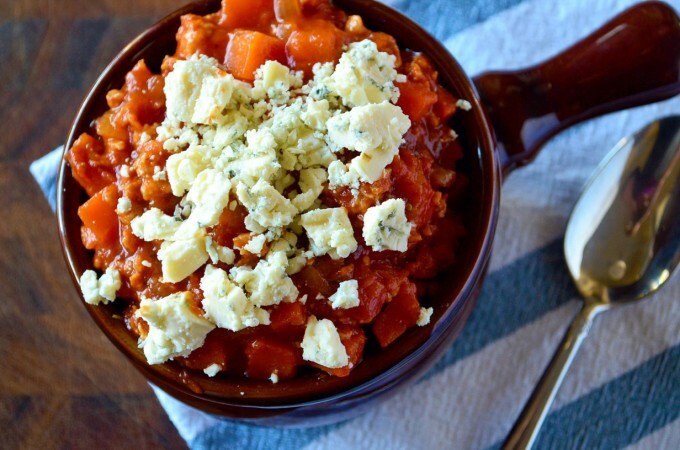 This Buffalo Chicken Chili is a delicious twist on Rachel Ray’s recipe. In about 30 minutes, you have an easy dinner that’s a healthy version of everyone’s favorite buffalo favorite. 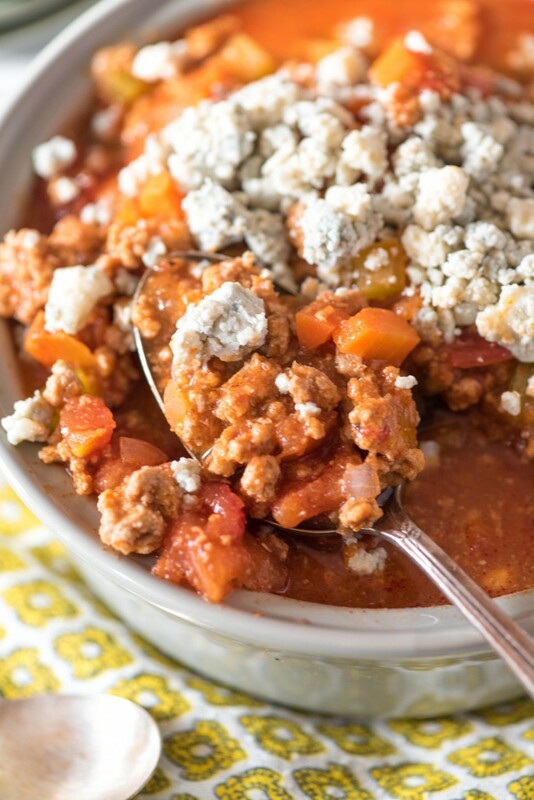 Make it on the stove, crockpot, slow cooker or Instant Pot! In a large pot over medium heat, heat the olive oil. Add ground chicken and break up with wooden spoon or other utensil. Add carrots celery and onion, sauté until beginning to soften. Stir in paprika and bay leaf; season with salt and pepper. Slowly add in chicken stock and hot sauce, followed by tomato sauce and tomatoes.Stir together and allow to simmer uncovered for 25 to 30 minutes until flavors have come together and soup has cooked down slightly. 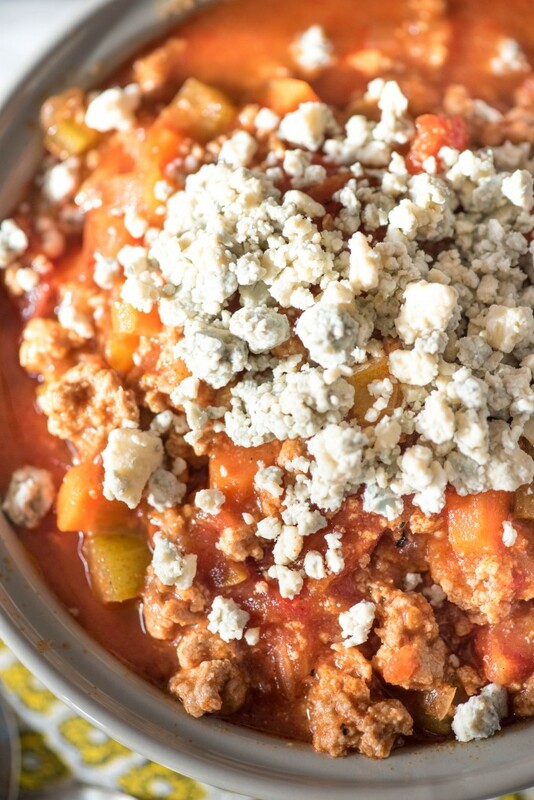 Serve topped with crumbled blue cheese.